Artists Assemble: Skateboard made of trash! In art we were asked to pick a group to construct a 3D piece of art. Some groups were plastic, wire, clay and trash. I picked trash because I felt like it would be interesting to make something out of things people used everyday. After making the groups, our group ot ideas from the internet of 3D art projects. We made a google docs where we had a list of ideas and pictures of some art projects. Surprisingly we found multiple ideas that all seemed interesting and fun to make. 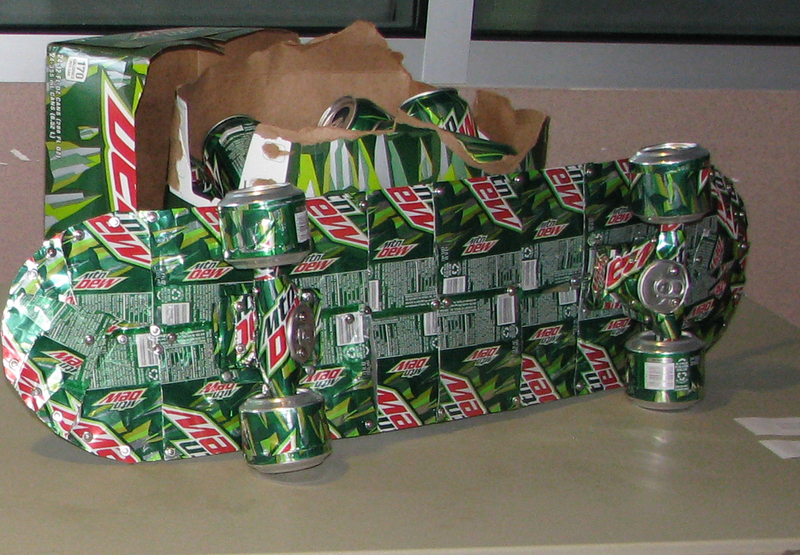 Although, out of multiple ideas our group decided to make a skateboard that was made out of cans. After deciding to make the skateboard out of trash we went around campus looking for cans and ended up with a lot of cans of different color. After we collected multiple cans (about 150- for only 3 people) we went on to making the shape of the skateboard. We got wood and drew out the shape of the skateboard and then our teacher continued on by cutting the wood into the shapes we drew out. From there we had to make the edges smoother so we got sand paper to smoothen the edges. From there we got to sticking the cans to the actual piece of wood. this was a long process that is still in progress. We are a group of 3 and so far we only have 2 boards (only the front) covered in colorful cans! I really like your skateboard ! I want to try skating one of those. Hi, yes I am a dancer but more towards electronic/pop. I don't really like contemperary because I am just not good at it. Any ideas on how to attach the wheels? I like your idea of recycling cans! When you were making this skateboard did you have this 'recycling' idea in mind? Also, how did you cut out the cans to make a perfect shape? It really looks accurate, like a store-made skateboard! Hi, yes we had the ideas of recycling in our heads. In fact that was our main idea. We wanted to take trash and create a 3D project and we looked online and then we saw a skateboard made of trash. We actually cut the cans twice to make them in the perfect shape- first off we were just cutting them and getting them out of the way but then once we were gluing them we didn't want to waste some of the can so we cut them again. We hot-glued them one by one. But we just put them exactly next to each other so we won't waste space and so it would look like an all in one. I like your idea of taking old cans and turning them into art! It looks really good so far! I'm Jilan from ASD, and I think your skateboard looks incredible. It's amazing how you were able to use cans to make a skateboard! And it's structured like a real skateboard, except is very unique. I really love your idea! I'm Alison from ASD. I think this skate board is so cool! It gives a great message of recycling item that would usually be considered 'junk.' I like how you can clearly recognise each logo. On a first glance, your idea of using recycled cans really intrigued me and I am fascinated by your creativity! This idea of making a skateboard using recycled cans seems really cool and I want to try building one myself one day! Looking forward to see more of your artworks! Hey, I'm Amanda. I really like the artworks you made. I think it's a really good idea to use recycled cans to make a artwork. I will like to try it out someday.